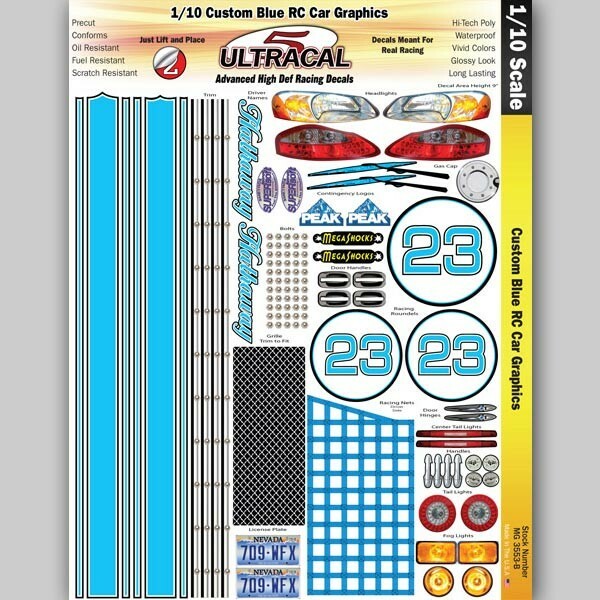 Ultracal High Definition Racing Decals - Custom blue radio controlled car graphics for 1/10 scale RC vehicles. Ultracal decals feature extraordinary detail, vibrant colors, popular design elements. Peel and stick application is very easy to perform. Ultracal racing decals are highly resistant to scuffing, scratching, and will not tear. All RC graphics are treated with a thin protective laminate film to make them last longer. + Easy to peel and stick precision pre-cut decals.